If you needed a reminder of the deadly hubris that can be fueled by marketing, technology and industrial one-upsmanship, there's a flurry of century-old tweets you might want to check out. 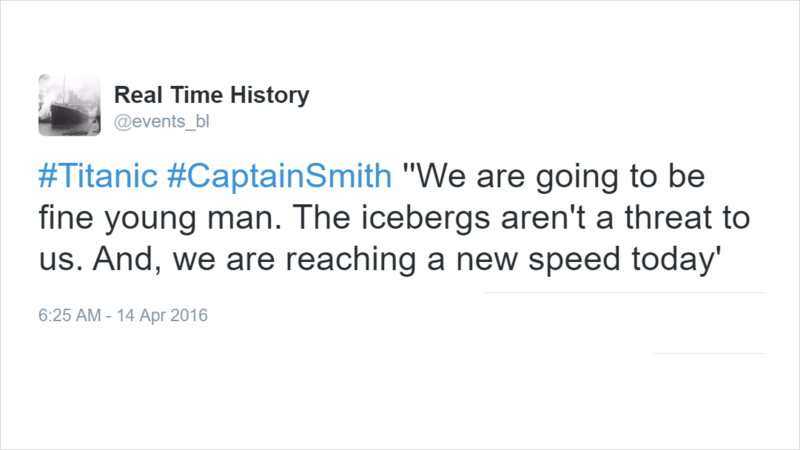 A Twitter account called Real Time History is currently documenting the last hours of the RMS Titanic, which struck an iceberg 104 years ago today and sank early the next morning. More than 1,500 passengers and crew members died in the disaster. Famously billed as "unsinkable," the Titanic was born from White Star Line's desire to surpass rival ships like the (equally ill-fated) Lusitania in both size and luxury. We all know the story in broad strokes—or at least in terms of how it affected the fictional romance between artistic drifter Jack Dawson and egalitarian socialite Rose DeWitt Bukater. But the details of the events, including the extent of warnings the ship's crew received, are likely still unknown to most of us. The Real Time History feed shifts between the perspectives of the recklessly bold captain, the troubled chief officer, the strata of passengers dining in varying levels of luxury, and the ominous indications of trouble from other ships at sea. #Titanic #ChiefOfficer "I have a queer feeling about this ship"
#Titanic #ChiefOfficer "I regret coming on this ship as a last minute decision. I still don't like this ship"
The forth nightfall has just fallen on Titanic. It is the last calm night she will ever see. Hat tip to Scott Monty on Facebook.